Energy • "They have no right to be here," says oil firm rep of their interruption of her business. Francisco Kjolseth | The Salt Lake Tribune Playing the role of "Oil Baron," Tim Tracy tries to reassure "concerned youth of Utah's" Jessica Lee regarding the development of tar sands as the protesters overtake the lobby of the School and Institutional Trust Lands Administration (SITLA) on Monday, April 23, 2012. Peaceful Uprising partnered with Utah Tar Sands Resistance in the skit at SITLA. Francisco Kjolseth | The Salt Lake Tribune Peaceful Uprising partners with Utah Tar Sands Resistance for a demonstration at the School and Institutional Trust Lands Administration (SITLA) office on Monday, April 23, 2012, as Sara Ma, left, and Sierra Hattier join the demonstration. 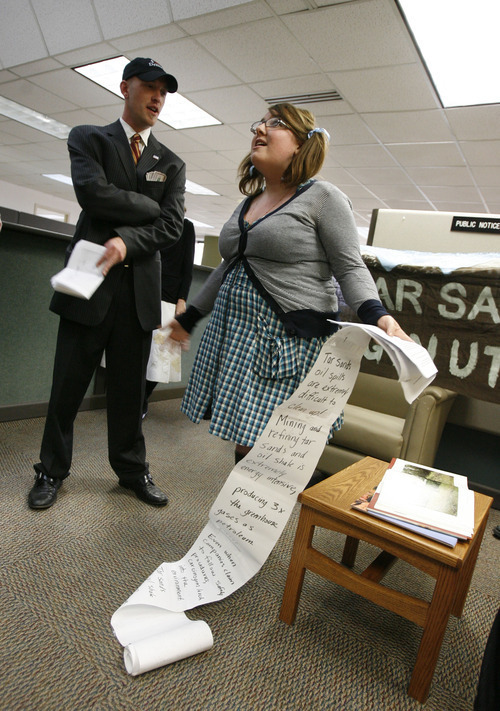 About two dozen environmentalists filled the lobby at Utah's school trust lands office to protest the state's lease of public lands for a tar sands mine. Utah Tar Sands Resistance and the climate-advocacy group Peaceful Uprising staged a brief skit in which two members played the role of School & Institutional Trust Lands Administration (SITLA) officials and another played a child asking them not to spoil the state on behalf of industry. Afterward the group sang "This Land Is Your Land." SITLA staffers looked on curiously. One said he called police, but the protesters left within 15 minutes and before anyone responded. During the demonstration, though, an independent representative of oil companies with SITLA business was irked. "I have to do business," SonJa McCormick told staffers behind the lobby desk. "They have no right to be here." "Our land," one of the protesters shot back at her. "Our land, too," she responded. SITLA Associate Director John Andrews, who missed the protest because his office is a floor away, said the agency doesn't mind free speech in the public lobby so long as business isn't disrupted. "It's a public office," he said. 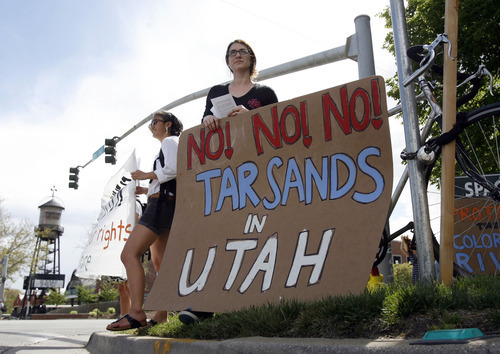 SITLA has a mandate to make money for schools, but Utah Tar Sands Resistance spokeswoman Raphael Cordray said it shouldn't mean favoring short-term gain over longer benefits from the land. That's especially true in the Book Cliffs, where Canadian company U.S. Oil Sands plans a mine, she said. "The Book Cliffs of Utah are too beautiful to be ground up into rubble and toxic tailing pits for money" she said. U.S. Oil Sands has said its process uses a citrus-based solvent that won't poison groundwater, though opponents say it will make carcinogenic tar compounds mobile.